Below are the services I provide as a marketing consultant and the pains/concerns they relieve. If any speak to you, click on the header for more detail or feel free to reach out. Need someone to help you think through your vision and message? Need help deciding how to approach your marketing challenges and workload? Wish you had someone to call or email for quick guidance or feedback when the need arises? Not sure what your unique story is and how you should message to the marketplace? Need help figuring out your brand strategy and identity? Need a better strategy to drive leads and support the sales process? Not sure of the best mix of tactics to find, attract and engage your audiences? Or how to start an inbound marketing plan or leverage social media? Need help with oversight of your marketing and sales support plan? Need a strategic messaging framework to better convey your value proposition or tell a ‘brand story’? Or help developing a content strategy to get leads and support the sales process? Too busy to create high-caliber presentations for executive & sales meetings or webinars & conferences? Got a big change coming up that will impact employee processes and productivity? Feeling like the leadership team and employees aren’t singing to the same hymnal? Need new ideas to better integrate external and internal communications and implementation processes? I can help. Give me a call. 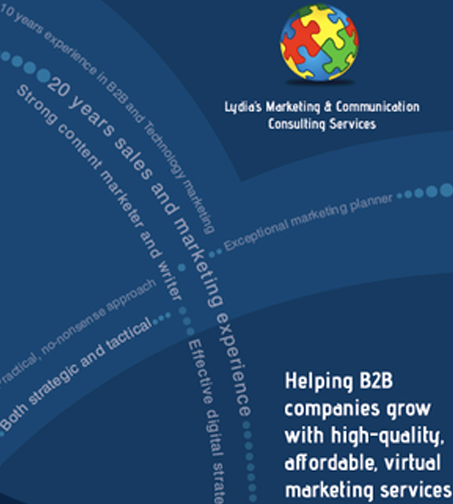 Read ‘Dear Marketing Consultant: What Services Do You Offer?‘ or download this brochure for more detail. Check out the About page to get to know me a little better. Or learn more about Who I Serve and what others say about my work.